Garmin’s nüvi 700 series brings two exciting new features: multi-destination routing and, “Where am I?/Where’s my car?” — to its popular pocket-sized GPS navigator lineup. 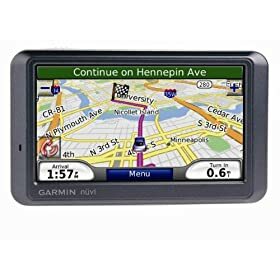 As with all nüvis, you get Garmin reliability, the fast satellite lock of an integrated high-sensitivity receiver, a slim, pocket-sized design with a gorgeous display, an easy, intuitive interface, and detailed NAVTEQ maps for the United States, Canada and Puerto Rico with more than 6 million name-searchable points of interest. All of the 700-series navigators also feature a rich array of features including spoken directions in real street names, MP3 player and photo viewer, and an FM transmitter that will play voice prompts, MP3s, audio books, and more, directly through your vehicle’s stereo system.The nüvi 760 and 770 add integrated traffic receivers and Bluetooth capability for hands-free calling. The nüvi 770 adds maps for Europe. The nüvi 780 adds enhanced MSN direct content capability.